What is a Cordial? What is a Liqueur? A Cordial or Liqueur is an alcoholic beverage made from a distilled spirit, such as Brandy, Vodka or Rum, then flavored with fruit, cream, herbs, spices, flowers or nuts, and bottled with added sugar. Cordials are quite sweet and not aged for a long period of time. The resting period to blend or marry flavors, can be anywhere from a few weeks, up to a year. Cranberry Rhubarb Liqueur is super delicious. In the US, liqueurs can also be called cordials. In Germany, liqueurs or cordials are called schnapps and in Scandinavia, aquavit. In some countries, a cordial means a concentrated non-alcoholic fruit syrup. Many cordials are served as after dinner “drinks” to help ad in digestion hence the ever popular after dinner drink, peppermint schnapps served over crushed ice. Think of it as a big piece of peppermint candy. This is the first time I have made a Cordial. 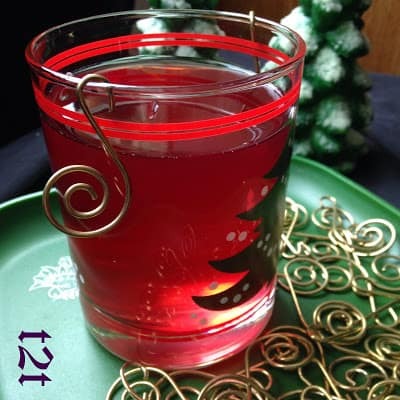 I wanted to make a Cranberry Cordial last year, to serve over the holidays but I didn’t realize you needed to let it sit for a few months before enjoying….so on to this year! I knew if I started the cordial now (August) it would definitely be ready for the holidays. In my freezer I had a zip lock baggie with 1 1/2 bags (one full 12 oz bag plus 1/2 of a 12 oz bag) of cranberries and 2 cups of rhubarb. All I needed was the Vodka. You can use Everclear Grain Alcohol but I decided to use just your basic vodka. It’s a whole lot cheaper to use plain vodka over the grain alcohol and since this was my first attempt at making a liqueur, I didn’t want to spend to much on something that might not turn out. The rhubarb and cranberries were frozen so I partially thawed them. Thankfully I chopped them before I froze them. If you have access to a food processor, mince the cranberries and rhubarb to a fine pulp. Otherwise use a pastry blender or food chopper and coarsely chop the cranberries and rhubarb. Leave some cranberries whole, if desired. 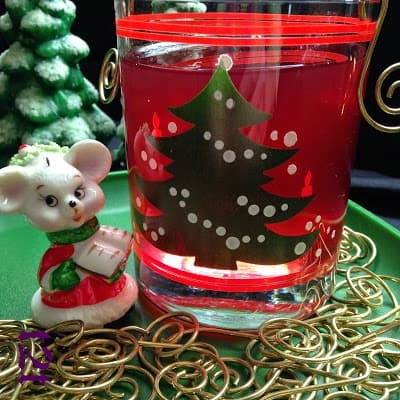 Put cranberries and rhubarb in a large glass jar. Add sugar, vodka and water. Stir. Cover tightly and set in a dark place at room temperature for at least 3-6 months. Before serving, strain cordial. Strain through double thickness of cheesecloth. Discard fruit. 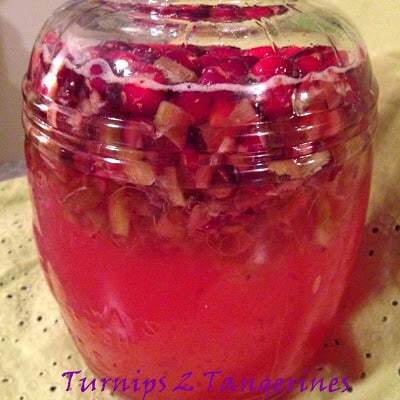 Store cordial in a jar or decorative bottle with a tight fitting top. a very strong cherry cough syrup….But in a good way. It is definitely a sipper. It can also be served warm, from your slow cooker. This cordial turned out different, unique and delicious. 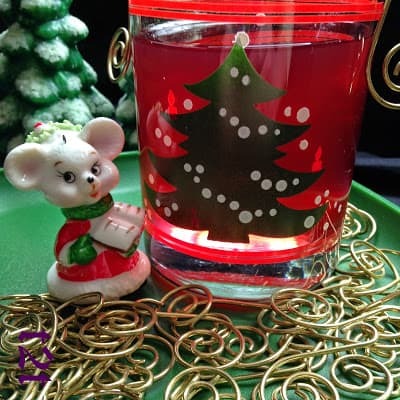 A wonderful festive holiday “sipper” Turn on some Christmas music..Nibble on Hors d’oeuvres and Sip a glass of this delicious cordial..while trimming the tree.